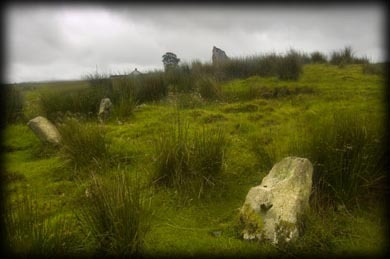 Situated on the eastern side of the mound shown below is a stone circle. At the time of my visit the weather took a turn for the worse, but luckily this site has easy access so I decided to take a chance. The circle is made up from 11 small stones with 4 more larger stones forming a tangential alignment running east to west on the southern side of the circle. Three of the stones that make up the alignment can be seen in the image above with the largest stone towards the right. 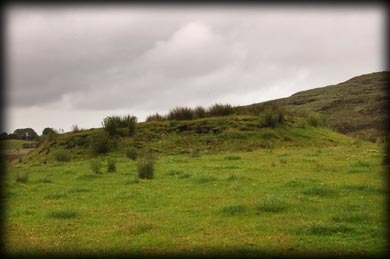 Most of the mound was created as the land was reclaimed from the bog, but there is evidence of a cairn towards the top of the mound west of the stone circle. I will definitely visit this circle again and try to acquire better images as the stones forming the alignment were very impressive. Situated: From Dungannon take the B43 West to Pomeroy, drive straight through here and after 1 kilometre take a left for Creggan, after approximately 3 kilometres you will see a lake on your left hand side this is Lough Mallon. Park just before the farmhouse on your left next to a gate. The circle is on the eastern side of the road behind the mound, pictured right. This mound can be seen from the road next to a small lake. Discoverer Map 13: H 6503 7520. Last visit Jul 2007.